Moyane was suspended from the tax agency on March 19. President Cyril Ramaphosa at the time accused him of overseeing a "deterioration in public confidence in the institution" and letting public finances become compromised under his watch. The affidavit, submitted to Advocate Azhar Bham, presiding officer of Moyane's disciplinary hearing, gives the details substantiating four charges made against Moyane. This charge date from mid-2016, when the director of financial watchdog the Finance Intelligence Centre (FIC), Murray Michell, wrote to Moyane flagging "suspicious and unusual cash deposits and payments" made into the accounts of two SARS employees – senior SARS official Jonas Makwakwa and junior consultant Kelly-Ann Elskie. The FIC referred the matter to SARS for further investigation to determine, among other things, if the payments constituted involved tax evasion, money laundering or corruption. Moyane acknowledged receipt of the letter and committed to investigating. But in his affidavit Gordhan - who was finance minister at the time - said that Moyane then disclosed the report to both Makwakwa and Elskie, which is unlawful. Moyane retained law firm Hogan Lovells to conduct an investigation into Makwakwa, who was suspended in September 2016. Gordhan said the tax agency not only failed to act on the recommendations Hogan Lovells and auditors PwC, but "effectively sabotaged" a PwC's forensic investigation by withholding vital information. Makwakwa was Moyane’s second in command, and the allegations against him in the FIC report were "extremely serious", said Gordhan. Moyane should have promptly suspended Makwakwa and Elskie, pending the outcomes of the investigation, he said. Gordhan also also took aim at Moyane for not informing him about the matter, saying he only learnt about it nearly four months later through a Sunday Times report. "He failed to brief me, the executive authority responsible for SARS, on the FIC Report at all. He only issued Mr Makwakwa and Ms Elskie with notices of intention to suspend, four months after receipt of the FIC Report, and only after the contents thereof had become public on the front page of the Sunday Times," Gordhan said. He further took issue with the decision to lift Makwaka's suspension in late 2017, as the reasons for his suspension "remained in existence". In the affidavit, Gordhan explained how the tax agency's SARS bonus framework worked. 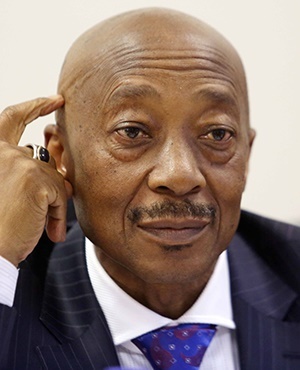 Moyane had approved a memorandum from SARS' human capital and development department to increase employee salaries at certain rates, as well as incentive bonuses. But Gordhan, in his capacity as finance minister, had not accepted the memorandum and had made amendments to certain provisions. Moyane subsequently paid performance bonuses to managerial employees, which Gordhan said contravened the SARS Act. "I urged Mr Moyane to adhere to the SARS Act and his obligations as accounting authority under the PFMA [Public Finance Management Act]," Gordhan said. The Auditor General found that Moyane's actions were inconsistent with the SARS Act. Gordhan said this finding further brought SARS into disrepute, causing it reputational harm. This charge involves two matters.The first dates to September 16, 2016, when Parliament published questions from DA MP David Maynier, relating to the FIC Report; and September 23, 2016, about allegations made against Makwakwa. "SARS' responses to the parliamentary questions, which were published on 16 September 2016 and 23 September 2016 respectively, were accordingly factually incorrect, misleading, and concealed the true state of events," Gordhan said. The second charge dates to February 2018, and relates to Moyane approving the recommendation for the appointment of New Integrated Credit Solutions (NICS), as one of eight service providers to collect debt on behalf of SARS. "The service providers were appointed for a period of eighteen (18) months at a projected total cost of R341 230 000," the affidavit reads. Subsequently, at a March meeting of the oversight committee on finance, Moyane answered questions relating to the appointment of NCIS. According to Gordhan, the then-commissioner's statement that he played no role in approving the appointment of NICS was false. This charge dates back to May 2015 when Moyane met with Helgard Lombard, a technical manager in SARS' Anti-Corruption and Security division. In this meeting, Lombard informed Moyane that he was to be interviewed by KPMG for an investigation into SARS' High Risk Investigative Unit. Gordhan said that Moyane asked Lombard him to call him the following morning. When Lombard had made the call, the commissioner told him not to attend the interview scheduled for that day. "Mr Moyane told Mr Lombard to feign illness in order to avoid attending the interview and stated that Mr Luther Lebelo, SARS' Group Executive Employment Relations at the time, would assist in this regard by informing Mr Van der Walt that Mr Lombard was unwell," Gordhan said. Such actions amounted to gross misconduct, he said. "By instructing Mr Lombard not to attend the interview, Mr Moyane ensured that information, relevant to the investigation, was withheld from the investigation." Moyane's lawyer Eric Mabuza told Fin24 on Thursday afternoon that they were considering the affidavit.